Edwin Bryant received his Ph.D in Indic languages and Cultures from Columbia University. He taught Hinduism at Harvard University for three years, and is presently the professor of Hinduism at Rutgers University where he teaches courses on Hindu philosophy and religion. He has received numerous awards and fellowships, published eight books and authored a number of articles on Vedic history, yoga, and the Krishna tradition. In addition to his academic work for the scholarly community, Edwin's Penguin World Classics translation of the Srimad Bhagavata Purana, the traditional source for the story of Krishna's incarnation, is both for Indology specialists as well as students and those interested in Hinduism from the general reading public and the yoga community. As a personal practitioner of yoga for 40 years, a number of them spent in India studying with traditional teachers, where he returns yearly, Edwin strives to combine academic scholarship and rigor with sensitivity towards traditional knowledge systems. 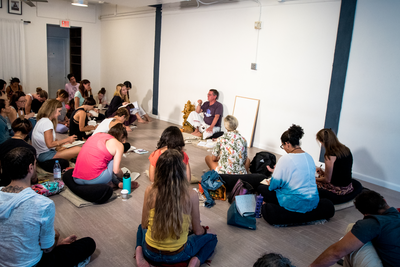 In addition to his academic course load, Edwin currently teaches workshops on the Yoga Sutras, Bhagavad Gita, and Hindu Philosophy at yoga studios and teacher training courses throughout the country. His translation of and commentary on the Yoga Sutras of Patanjali (North Point Press, a division of Farrar, Straus & Giroux, 2009) is specifically dedicated to contributing to the growing body of literature on yoga by providing insights from the major pre-modern commentaries on the text with a view to grounding the teachings in their traditional context. His most recent work is a sequel to this by the same publisher entitled Bhakti Yoga: Tales and Teachings from the Bhagavata Purana. This work, too, seeks to ground the practices of Bhakti in a traditional framework.